Coffee lovers unite to "power" local cafe! THEN They will dedicate 50c from each coffee sold (25-29 June) to the purchase of solar panels for their roof. Every coffee purchased in a week goes towards solar panels for local cafe! A great sustainability leadership initiative for Carlton businesses. In early 2012 the City of Melbourne decided to undertake a challenge…one of the Carrotmob nature. 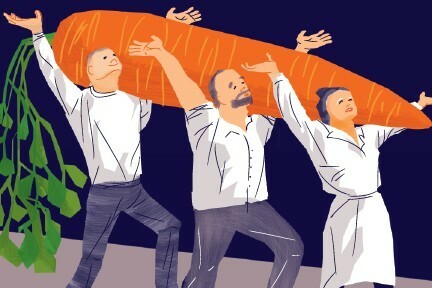 The Council’s mission was to engage local businesses in Carlton, Melbourne to identify ways to reduce their environmental impact and one lucky business (by way of online public vote), would win the Carrotmob. SO, WHO IS CAFE LUA? Café Lua, a small happening place of deliciousness, is very committed to reducing their environmental impact. They've undertaken a range of initiatives including switching to compostable and reusable coffee cups, installing efficient lighting and water faucets, offering used coffee grounds for compost and installing leavers on windows to encourage natural air flow. Café Lua now wants to take their sustainability leadership to a whole new level in the Carlton business community by installing SOLAR POWER. Carrotmob - let's help make it happen! To be part of the Carrotmob and support this initiative simply rock up and buy a coffee/ssss from Cafe Lua during the week of 25th - 29th June (on average they sell 1800 coffees a week! let's smash it!). The week long event will culminate in a Carrotmob celebration on the Friday from 10am - 12pm!